Vogel’s introduces a healthcare solution with the new medical mounts. With these Vogel’s medical mounts you will be able to mount a display to the wall in order to give the patient the best possible AV experience. It’s easy to adjust the medical mount in height and depth. Above it is possible to turn and tilt the screen. By these you will create the ideal viewing angle. This will reduce the chance on neck and back complaints. It is possible to keep the cables out of sight in the arm. The antiseptic powder coating assist in controlling the spread of diseases. Watching TV in hospital is a lot easier for patients with a Vogel's mount. They don't need to move towards the TV, the TV moves to them! If one can't sit up straight, they can turn the TV towards themselves using just a fingertip. If one stops watching TV, than they can easily hide the TV out of sight again with just the slightest push. Whether one sits up straight in bed or is required to remain lying down, a Vogel's hospital mount creates optimal viewing enjoyment. The mount is adjustable in length but also in depth, you can turn it and also tilt it, ensuring that patients can always position their TV in exactly the right place. Because the mount is equipped with a gas spring, one can operate it completely with just a fingertip. Convenience is paramount! To provide patients with as much relief as possible, Vogel's includes a sturdy, flexible and easy to operate wall mount in its assortment, with which the TV can be mounted on the wall. This means that the TV doesn't take up space when a patient needs to be treated but the TV can be placed in any position if the patient wants to watch TV in his or her own way. 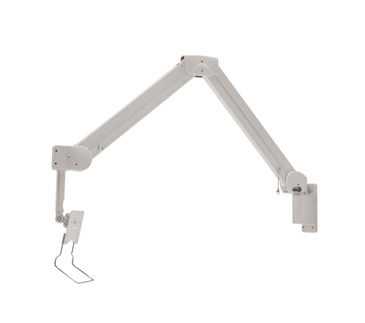 These wall mounts have 4 pivot points and are suitable for screens up to 26" (66 cm). The weight capacity of the product is 1-4 or 3-8 kg. The wall mount is suitable for screens that meet VESA hole patterns of 75x75 or 100x100mm. Tablets can be installed by using our attractive TabLock enclosures. 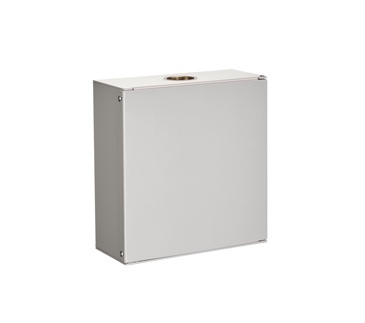 The wall box can be used to hide cables (over length) and store power sockets.